Hi, I'm facing a problem which is can't total up all the subtotal amount. Everytime I add a new product to cart, the total only show the last product that I added into cart. 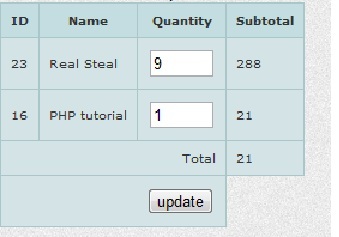 Not only that, when I update the quantity of other product, the total still remain the last product price. The picture above you can see the total only show the amount 21. Any solution? <a href="index.html">D&W CD Rental Store</a> all rights reserved. //get the name, description and price from the database - this will depend on your database implementation. $total is reset in your loop to 0 at line 120. try moving line 120 outside of your loop (before line 105). How do I sent a form input element to my shopping cart?